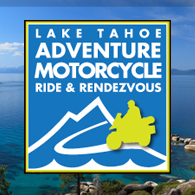 Carson Valley and Lake Tahoe Adventure Motorcycle Ride & Rendezvous is just days away – August 22–25, 2013. Rev your engines and celebrate the freedom of riding in remote and gorgeous natural environments with other motorcycle enthusiasts at the Lake Tahoe Adventure Moto! Explore paved mountain roads as well as off-road trails. Participate in an excellent adventure riding clinic and a fun beach BBQ. Check out vendor displays and choose from a variety of regional ride itineraries. This a unique event for adventure and sport riding enthusiasts that places the emphasis is on the passion for riding (which means there is no show-n-shine or anything like it). At the Carson Valley and Lake Tahoe Adventure Motorcycle Ride & Rendezvous there will be a number of seminars that cover everything from taking amazing pictures to fixing a flat while you’re on a ride. Check out the extensive event schedule for a full list of all the planned activities. While cruising the lake be sure to check out some of many great Lake Tahoe beaches for great views and amazing crystal clear water. Looking for more Lake Tahoe recreation and events? See our Lake Tahoe events calendar and our online guide to Lake Tahoe activities going on now.